Just eaten this ice monstrosity! 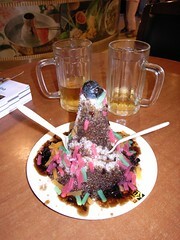 Its shaved ice lovingly shaped into a pseudo volcano, and then thumb stuck in the top to take a shrivelled black fruit of some kind and then lots of different coloured fruit syrups poured all over. I was disappointed not to get beans too. Looks like the perfect accompaniement to beer, too! Everything is the perfect accompaniement to beer! Mind you, we've now had Beijing Belly for 3 days, so I'm starting to think it wasn't my most brilliant idea for this week.